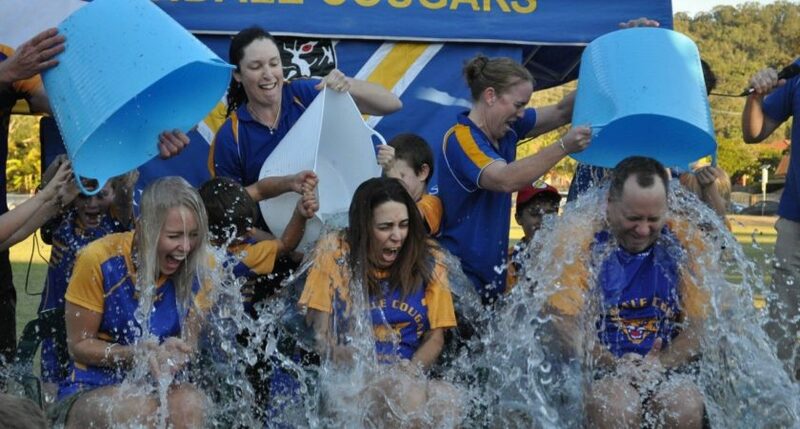 Thursday’s training ended a little differently than usual, as coaches, managers and club presidents of the Carindale Cougars Junior Australian Football Club walked away cold and dripping wet, but with a heavy bucket of donations in hand. The generosity, support and turn-out on Thursday afternoon was nothing short of overwhelming for Club President Evan Marshall. The AFL have been fundraising for the past four years at the renowned ‘Big Freeze at the G’ event to help fight the devastatingly fatal Motor Neurone Disease (MND). As AFL celebrities and famous faces toboggan down a slide into a freezing pool of ice water, money is donated to help fund the research of finding a cure for the cause whilst providing an amusement of entertainment. Legendary AFL star, Neale Daniher from the Essendon Bombers and later coach of the Melbourne Demons was diagnosed with MND just four years ago. Neale is a prominent campaigner and ambassador for medical research to find a cure for MND and an inspirational figure renowned for his resilience, strength and positivity. With a similar idea to the Big Freeze in mind, the Cougars planned to support research to find a cure for those like Neale who are affected by MND. Instead of famous faces, the Cougars Club Coaches became the celebrities. The event rules stated that if the teams didn’t quite reach their target dollar value, their coach would remain dry. With an individual team target of raising either $100 or $200 per team and a club goal of totalling $1500, the Cougars community stepped up to the challenge. “Many of the teams blew their targets out of the water, which resulted in most of the managers and committee also getting wet,” Marshall told aflq.com.au. Over the three-week period leading up to the event, the Cougars raised $4,492 for MND. “Every cent we raised will go directly to help fund research to find a cure for MND,” said Marshall. The success of the Cougars’ MND Ice Bucket Charity Event is due to the benevolence and giving nature of the club’s members, friends, and families. All nine Cougar teams were encouraged to participate and exceeded the club’s expectations of how much they could fundraise for such an unforgiving disease. “Without the generosity of the local community, the challenge couldn’t have been as rewarding as it was,” said Marshall. “Our spirit and involvement as a small football club is what we pride ourselves on. We wanted to host an event where both the kids and adults could get involved whilst raising money for an important cause,” said Marshall. Every Junior football club has a different story to share about their club’s commitment to supporting communities who need help most. The Carindale Cougars JAFC proves that big hearts, community support and voluntary generosity goes a long way within a small club like theirs and for organisations such as MND Australia.